A cataract is a translucent layer formed behind the iris and pupil of the eyes. Cataract is generally associated with older people. The first sign of the cataract is blurred vision. The patients may find it difficult to see things. Unless treated early, it leads to the advance stages of cataract impairing the vision of the patient. As per Ayurveda, cataract is the result of Kapha and Vayu disorder. Eyes of a person with Kapha influence gradually accumulates Kapha molecules in the eyes and Vayu disorder dry it up which gradually reduce eye’s transparency leading it to multiple vision problems. Hygienic practices like cleaning eye regularly with clean water, healthy diet, etc. keeps eye problems away. In case someone got a cataract problem and is diagnosed to be in the early stage below remedies can be useful. It is observed that Triphala tea eye wash is a very useful and natural remedy to treat it. Triphala tea wash helps in dissolving Kapha molecules which are the reason of cataract. Take one teaspoonful of Triphala and add it to a cup of water. Boil it for 2-3 minutes and let it cool down. Filter it properly with a clean cloth to remove all particles of Triphala. With that water, wash patient’s eyes. Repeat this procedure 2-3 times. Discontinue if the patient complains of discomfort. Carrot is found to be useful in treating cataract. Patients should be given raw carrots in his/her breakfast/lunch/dinner. Carrot juice can also be given to the patient twice daily. Garlic is an excellent herb to treat cataract condition. Give 2-3 cloves of it to the patient daily. It is most useful when chewed slowly and eaten. If the patient is not at all ready to eat due to its pungent taste and smell, a paste can be made of it and given to the patient. Take few kernels of almonds, half a gram of pepper and grind it finely. Add this to a cup of warm water. 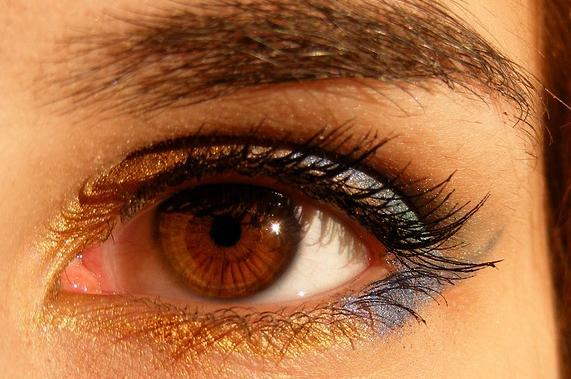 This mixture can be taken for a few days to restore eye vigor. Apply a drop of pure castor oil without preservatives to the affected eyes before going to bed at night. This can also be used for prevention of cataract. Apply the paste of pumpkin flower on the eyelid. It helps stop/slow down the advancement of cataract in the eyes. Take 10 grams of Punarnava, 6 grams of Brahmi, 6 grams of Shatavari. Mix and Grind these finely. Take a half teaspoonful of this mixture and add it to a cup of warm water. Take this once daily. This helps in curing cataract. It also helps in preventing Cataract development. Maha Triphala Ghrita is a well known Ayurvedic medicine to treat cataract. If the cataract is in the early stage, this medicine is found to be very useful. Chandrodaya Vati is advised to be applied externally to treat cataract.Note that its application of this medicine can be little skin irritating, which helps in blood circulation near the eye helping faster curing of the disease. Diet plays a crucial role in curing cataract. Avoid all kinds of fried fast foods. All pungent, sour and saline foods should be avoided. Take lots of water. Avoid sea salt in all food. Instead, patient can use rock salt. Patients can take rice, wheat, Moong dal, grapes, apple, pomegranate, etc. Try to take fresh vegetables instead of the frozen foods. Don’t let the patient be exposed to excessive heat and light. Keep the patient calm. It is advisable for the patient to meditate and perform different yoga postures. You have given the harbal trearnent for cataract punarva bhrami satavari.. Its remove cataract in how many days..